Storebought, homegrown, and gifted seeds all intermingle in my seed box. Before ordering for the next year, I always sort through, removing packets that are too old or are filled with varieties I tried and didn't like. Next, I pull out saved seeds from two years ago and put them in a to-go-soon pile --- these are insurance just in case the ones I saved in 2012 don't turn out quite right. Meanwhile, I set up a germination test for seeds that might no longer be viable. I often buy seed packets that hold more than one year's supply if I know I like the variety, but it's worth testing these older seeds to ensure they'll still sprout the next spring. With all those ducks in a row, my seed bill is always under $100 (and often considerably less) for a vegetable garden large enough to feed us year-round. I do spend a lot more on straw and cover crop seeds, but we still consider the delicious food a bargain. I soak old bean and pea seeds for the chickens, rounding off their healthy diet with a POOP-free chicken waterer. I was getting frustrated with my disorganized seed box recently, so I pilfered someone else's idea online of using a 4"x6" photo album with those clear sleeves for storing seed packets. I'm able to put everything in order chronologically, which I really like. 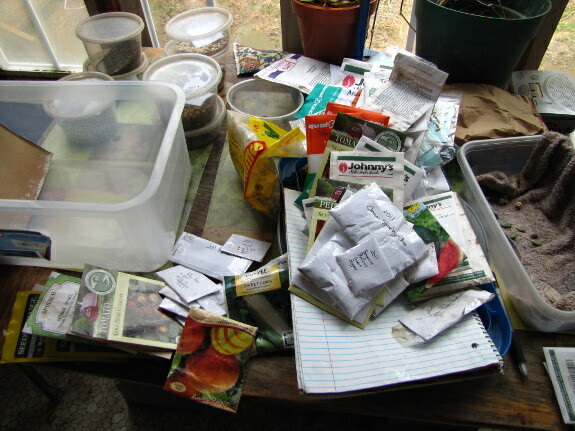 I think I remember your seeds being very organized and you probably already have a good system in place, but just thought I'd mention it if you were on the hunt for something new/different. I felt like I spent a lot on seeds for our first garden out here (~$150), but I figure I'll be able to recoup some of the cost by saving seeds, too. Lately, I have been hating how disorganized my seeds are. I keep everything in a shoebox and at one point, everything was organized by categories, but over the past year, things have just gotten thrown in there in no order whatsoever. I've gotten more seeds since then and my old system won't work, so I've been trying to make little dividers for the shoebox to physically separate the seed packets. We'll see how well that works.